On Wednesday, February 16, 2011, the Albany Law Review will host it's annual Chief Judge Lawrence H. Cooke State Constitutional Commentary Symposium. This year's participants are three of the nation's most eminent jurists. 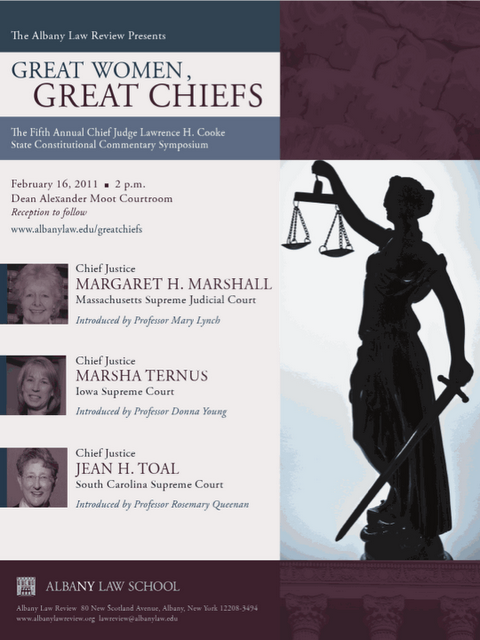 Chief Justice Margaret Marshall of the Massachusetts Supreme Judicial Court, Chief Justice Marsha Ternus from the Iowa Supreme Court, and Chief Justice Jean Toal of the South Carolina Supreme Court will share their insights as the presiding members of the highest court and the judicial branch of their respective states. The event begins at 2 p.m. at Albany Law School, in the Dean Alexander Moot Courtroom. A reception will follow. Join the Law Review for this very special event.